If you want to know the current methods that are catching on our waters, or to see the latest fishing reports and photographs then head to the UAA Blog. During 2015 the Association has gone some way to address the problems of disabled access. Obviously, because the Tarn is surrounded by agricultural land, the very nature of this land precludes any work in this area. However, the access to the field has been considerably improved by removing the stile and providing a level approach through a Kissing Gate. The Kissing Gate and new Field Gate were procured from George Barker & Sons of Backbarrow. 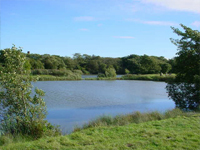 Sandhall Ponds are located just off the A5087 Coast Road in South Ulverston, Cumbria. There is superb carp fishing with Mirror and Common Carp close to 20lbs. The water also holds Tench to 8lbs and a sprinking of other mixed coarse fish. Sandhall Ponds are predominantly a Carp Fishery aimed at the carp angler whether they be beginner, intermediate or specialist. 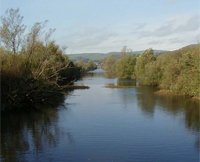 Sandhall Ponds is a quiet idyllic water comprising of three ponds which are all interlinked. Access is available for disabled anglers. Sandhall can only be fished by season ticket holders. For more details about Sandhall Ponds please follow the link. Knottallow Tarn is a premier Brown Trout fishery, located just over a mile North of Ulverston in Cumbria. There is superb sport for the fly fisherman as the fishery has an abundance of natural fly life. This game fishery will appeal to anglers who adopt an imitative approach and has something to suit everyone, whether you're a novice or a seasoned fly fisherman. There are magnificent views over the Lakeland Fells and out over Morecambe Bay. Day tickets are now available for Knottallow Tarn. For more details about Knotallow Tarn please follow the link. Ulverston Canal is a first class mixed coarse fishery and holds good stocks of Roach (to 2lb), Perch (2lb+), Rudd (to 1lb), Crucian Carp (to 1lb), Eels (4lb+), Pike, (20lb+), Common Bream (to 6lb), Carp (20lb+) and Tench (7lb+). The canal holds a good head of quality tench between 3-6lb and is celebrated for its Tench fishing, early season bags have topped 100lb. Good bags of mixed coarse fish can be had from any of the pegs along its mile and a quarter length. The canal also holds a good head of large Mirror and Common Carp. For more details about Ulverston Canal please follow the link. UAA E-Tickets - day tickets available to purchase from our web site. Follow this link if you would like to purchase an E Ticket for one our waters.